Dunkin’ Donuts and its sister chain Baskin Robbins are planning on a major expansion in 2014. Take a look at the history of the iconic chain. Left: In almost everything but prices, the first Dunkin’ Donuts on Southern Artery in Quincy is a blast from the past, complete with its old-fashioned script outdoor sign, question mark counter with stools, doughnut tables, and baked goods on display as you enter. Bill Rosenberg opened a doughnut restaurant named “Open Kettle’’ in 1948 in Quincy on Southern Artery. In 1950, the restaurant was renamed “Dunkin’ Donuts.’’ The first franchise of the restaurant signed in Worcester five years later. Left: A look at the original Dunkin’ Donuts restaurant. The renovated Dunkin’ in Quincy has restored the counter. Canton-based Dunkin’ Donuts doesn’t plan to approve any more blast-from-the-past renovations. Left: A look inside a 1970s Dunkin’ Donuts. By 1963, the 100th restaurant in the chain opened. Munchkins were released in 1972, and muffins were added to the menu in 1978. A year later, the 1,000th franchise opened. Left: An old Dunkin’ Donuts sign in Allston in 2007. It was one of the last remaining ones in that style. In 1982, the company began its famous “Fred the Baker’’ commercials. 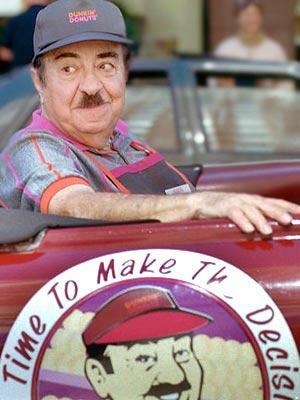 Fred, played by Michael Vale, became one of television’s most enduring and endearing pitchmen. In 1990, the 2,000th restaurant opened, and in 1992, the 3,000th restaurant opened. Bagels were added to the menu at Dunkin’ Donuts in 1996. Breakfast sandwiches were added the following year. Vale, who was a part of 200 commercials over a decade, was the chain’s pitchman until 1997. Left: Vale and former Dunkin’ Donuts chief executive Bob Rosenberg at the original Quincy Dunkin’ Donuts location in 1995. Dunkin’ Donuts headquarters moved to Canton in 2004. Left: Dunkin’ Donuts culinary technologist Bob Pitts, chef Ming Tsai, and Dunkin’ Donuts executive chef Stan Frankenthaler at the Canton facility in 2006. Dunkin’ Donuts began its “America Runs on Dunkin’’’ marketing campaign in 2006, the same year its parent company was acquired by a consortium of private equity firms: Bain Capital, The Carlyle Group, and Thomas H. Lee Partners. It opened its first restaurant in Taiwan in 2007. During the past several years, Dunkin’ Donuts has accelerated growth and laid out ambitious plans to double the chain to 15,000 stores in the United States. The business plans to focus its development on existing markets east of the Mississippi River, where the brand has about one Dunkin’ for every 48,400 people as of November 2011, according to the company’s prospectus. It hopes to expand to Southern California by 2015. Dunkin’ Brands Group was a hot stock its first day of trading on the stock market in July 2011 with shares soaring 46 percent above the initial public offering price, even as a looming US debt default cooled the rest of the market. 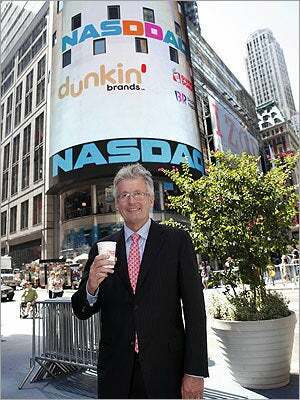 Dunkin’ Brands chief executive Nigel Travis, left, said he was pleased with Wall Street’s response and that of Dunkin’ fans who buzzed about the chain on microblogging service Twitter. Dunkin’s latest innovation, the glazed doughnut breakfast sandwich, was introduced in a few eastern Massachusetts locations in April 2013. The sandwich became part of its permanent, national menu in June. The chain also tested gluden free cinnamon sugar doughnuts and blueberry muffins in some Boston-area locations in January of 2013, according to BostInno.com.